And now Bond meets Q.
Fifty years after its cinematic start in Doctor No and four years after Quantum of Solace, the latest iteration in the James Bond franchise is the hotly anticipated Skyfall. 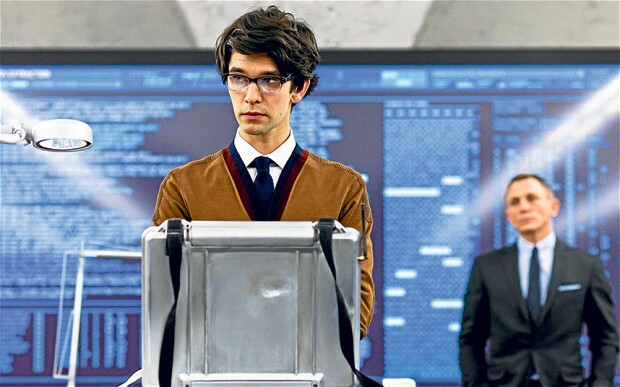 While viewers had lofty expections, did Skyfall live up to the hype? Skyfall follows Agent 007 (Daniel Craig) as he tries to track down an individual blowing the covers (and subsequently causing the deaths of) NATO agents embedded in terrorist organizations. It doesn’t take long before he finds the cause to be Silva (Javier Bardem), a ghost from M’s (Judi Dench) past. Skyfall wastes little time with character introductions and immediately drops you into the action as Bond chases a terrorist throughout the streets of Turkey. In the space of a few minutes, he chases him on a motorcycle, both of them wind up on top of a train, and Bond uses a digger to clamber onto a passenger car after said terrorist disengaged the coupling. Sam Mendes, known for movies like American Beauty, helmed Skyfall, and what I distinctly remember was absolutely gorgeous cinematography. One of my favorite scenes was when Bond was battling the sniper in Shanghai. The fight took place in a tower with expansive windows, allowing for a clear view of the massive, bright advertisements outside. What resulted with that and how Mendes maneuvered his camera was an absolutely perfect melange of light and shadow. Also, while Casino Royale (2006) and Quantum of Solace tried to sort of distance themselves from the older Bond films, Skyfall really seemed to embrace its Bond roots. Bond even drives an Aston Martin DB5 exactly like the one from Goldfinger (1964), right down to its ejection seat. The story, however, had its strengths and weaknesses. On one hand, I thought Silva was an absolutely terrifying villain, particularly with how Bardem portrayed him. On the other, Bond failed just about every test MI6 threw at him in order to declare him fit for service, yet his performance in the field didn’t show any deterioration from what you would expect from James Bond. What I smell is a subplot the movie originally planned to explore, but didn’t due to what was finally released still being a little less than two and a half hours long. I have to say though that despite being as long as it was, I never felt inclined to check my watch to see how much time was left in the movie. Skyfall achieved near perfection in pacing, showing slick action scenes while also allowing for reflection. The movie also introduced Q (Ben Winshaw) for the Craig continuity. Thankfully, Bond did not gain the dependence on gadgets that he did in the Brosnan era. The music also stood out in a good way. With exceptions, James Bond films feature terrific soundtracks with great title numbers performed by a popular musician of the time the movie came out. Adele’s “Skyfall” actually might have replaced a song in my Top 5 James Bond Theme Songs. It fit the mood of the movie perfectly, and actually stands on its own as a great song. While not perfect, Skyfall is a great way to celebrate fifty years of the James Bond film franchise. It keeps you on the edge of your seat while simultaneously keeping you in awe of its use of sound and visuals. I dare say I liked it as much as Casino Royale and even as much as a classic like Goldfinger. It was a vast improvement over the disappointing Quantum of Solace and I will also say in general it is the best action film that I have seen in a long time.